The same brown bear attacked two men this week, killing one who had last been seen Monday before setting off on a hike, according to Anchorage police. The second man was injured Wednesday as a group searched for the missing hiker, police said. Searchers found the body of Michael Soltis, 44, on a trail Wednesday near the end of Hiland Road in Eagle River, police spokesman M.J. Thim said. “We’ve got multiple officers that are protecting the body from the bear, so we can safely remove the victim and return him to his family,” Thim said midday Wednesday. In a Facebook post, a neighbor wrote that Soltis was due to be married and had a child on the way. Soltis’s vehicle was found at his house near Mile 8 on Hiland Road. An avid hiker who regularly went out alone, friends and family assumed he was out on an area trail. Soltis was reported missing Tuesday. Police and volunteers searched the area through the night and into Wednesday morning, using information from Soltis’s cellphone. An Alaska State Trooper helicopter also joined the search Wednesday. 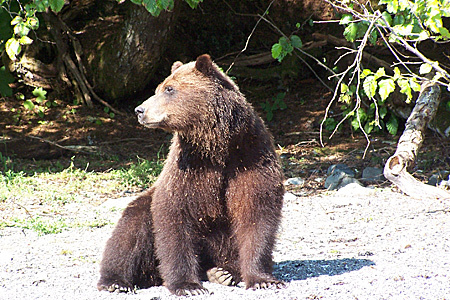 That’s when, according to police, the same brown bear attacked a man in the search party. That victim has not been publicly identified. He was rushed to a hospital with serious injuries to his leg, but is expected to survive, police said. Thim said the bear likely attacked the second time because the volunteer searchers had approached Soltis’s remains. “The brown bear was protecting the body for themselves,” said Thim, adding that the officers surrounding the body Wednesday were armed with rifles. Thim said that as of midday Wednesday it is unclear if the bear will be killed as a result of the attacks but said that officers are ready to defend themselves, given the animal’s apparently aggressive behavior. The attacks prompted a warning from Anchorage police to stay away from the end of Hiland Road. Alaska Public Media’s Emily Russell contributed reporting to this story.